And shame -- through social and mainstream media voices -- is the left's whip keeping Americans in line. Most Americans understand the penalty for thought crimes on issues ranging from traditional marriage to affirmative action to American citizenship. Say the wrong thing, write the wrong thing, even think the wrong thing, or tweet the wrong thing -- in referencing positions that were mainstream only a few years ago -- and you'll be publicly shamed in media. You'll be shunned as a homophobe or a racist or ultra-nationalist and mocked and probably lose your job. But if you're of the left, and happen to be a Democratic Party politician, you can get away with making excuses for notorious anti-Semite and Nation of Islam leader Louis Farrakhan. Farrakhan's hate and the left's silence are nothing new. It is part of Chicago's political landscape, an unspoken contract, and Chicago has become quite used to it. Under this arrangement, in Washington, Chicago and just about every big city, African-American politicians can cozy up to Farrakhan, and his hateful eruptions are allowed to pass beneath our notice, like a stone tossed in the Chicago River. 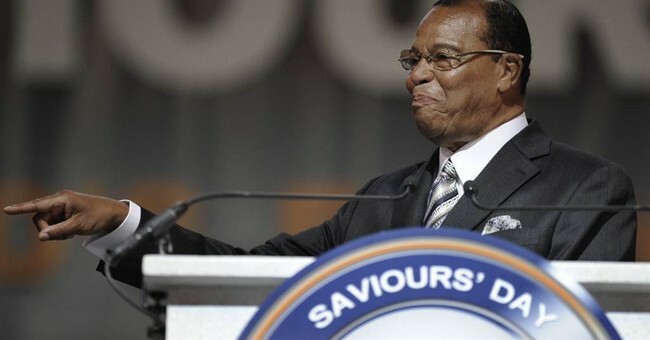 And if it weren't for The Daily Caller and CNN's Jake Tapper, we wouldn't have known about a particularly ugly Farrakhan eruption the other day at his Saviours' Day 2018 address. We also wouldn't have known about the tortured logic that some, like U.S. Rep. Danny Davis, the Chicago Democrat, use to explain their relationship with Farrakhan. "White folks are going down. And Satan is going down. And Farrakhan, by God's grace, has pulled the cover off of that Satanic Jew, and I'm here to say your time is up, your world is through," Farrakhan said in his speech. He said other things too, but I'm not going to spread his hate here. What interests me is the silence of the left. My barber, Raffaele Raia, understands this kind of silence. "Chi tace acconsente," says Mr. Raia. "He who is silent says yes. The silence is the consent." And when it comes to Farrakhan, the left is silent. They'd rather be silent than risk being denounced by him. The other day, The Daily Caller -- a conservative news and opinion site -- capitalized on the silence, and on the acquiescence of Davis, who was quoted as saying Farrakhan's views aren't a big deal. "I'm a pretty global individual. So I know Farrakhan, I know the Middle East question, I know the Jews and Farrakhan -- I know all that, but that's not what I spend all my time focused on," Davis was quoted as saying by the Daily Caller. "I know Farrakhan, been knowing him for years and years and years and years and years, and every once in a while some writer or somebody will I guess try to think of something to say about Farrakhan, but nah, my world is so much bigger than any of that. I don't have time for that. I deal with it, you know, when it comes but nah, that's not a real part of my focus. "That's just one segment of what goes on in our world. The world is so much bigger than Farrakhan and the Jewish question and his position on that and so forth. For those heavy into it, that's their thing, but it ain't my thing," he said. "Nothing could be further from the truth," Davis said in his statement, adding that he has spent his life condemning all forms of hatred and bigotry. It was an impressive denunciation. So I called Davis' office and spoke to Ira Cohen, Davis' director of issues and communications. There was silence. I thought he didn't hear me. So I asked again. "I heard what you said, yes," Cohen said. He said he'd get back to me if Davis had anything to add. I'm not holding my breath. But few, if any Democratic voices are being raised against Farrakhan. The Congressional Black Caucus certainly won't condemn him. And white Democrats aren't demanding condemnation either. They don't want to risk losing votes. "It is so sad that if white people disapprove of somebody, we follow suit and disapprove," Farrakhan said in his Saviours' Day speech. "It's so cowardly." But they're not saying much. They're not saying much at all. What we're witnessing is the Balkanizing of the United States. And the left's silence about Louis Farrakhan is the canary in the coal mine.